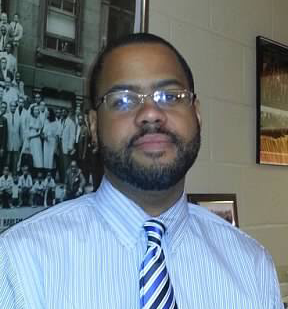 Mr. Tarik Rowland is in his twelfth year as Director of Bands at Tri-Cities High School in East Point, Georgia and his eighteenth year as a music educator. An Atlanta native, Mr. Rowland attended Riverwood High School. His undergraduate work was completed at Georgia Southern University and Masters of Music Education work at Shenandoah Conservatory in Winchester, Virginia. Mr. Rowland has completed all course work and comprehensive exams and is a Doctoral Candidate (A.B.D.) in Music Education at The University of Georgia Hugh Hodgson School of Music. During his undergraduate career, Mr. Rowland was a member of the 1996 Atlanta Olympic Band, the Georgia Southern University Wind Ensemble, the Georgia Southern University “Southern Pride” Marching Band, Lead Trumpet player for the Jazz Ensemble, and the Principal Trumpet for the Georgia Southern-Statesboro Symphony Orchestra. He studied undergraduate conducting with Dr. Daniel Pittman and graduate conducting with Dr. John Lynch, Mr. Mark Cedel, Dr. Scott Nelson and Colonel L. Bryan Shelburne, Jr. of The U.S. Army Band “Pershing’s Own”. Under Mr. Rowland’s leadership, the Tri-Cities Band Program has grown from 45 members to 185. The Wind Ensemble (performing level VI music) and the Symphonic Band (level IV/V), the Concert Band (performing level II/III) along with the Marching and Jazz Bands consistently earn superior ratings at all adjudicated events. His bands have performed in Disney World’s Magic Music Days, the 2009 Historically Black College & University Band Directors Consortium, the Atlanta Jazz Festival, Southern Star Invitational Southwest Airlines, Delta Airlines, and for MTV’s Boost Mobile Rock Corps Concert. The Wind Ensemble was invited to perform at the Lincoln Center for Performing Arts and to participate in the Pre-Olympic Ceremonies in Beijing, China for the 2008 Olympics. In 2012, Mr. Rowland was selected as one of Fulton County’s Star Teachers. Most recently, Mr. Rowland was selected as a Quarter Finalist for the first ever GRAMMY Music Educators Award and in 2014 he received the Georgia Musical Theater Shuler Award for best Orchestra. Mr. Rowland’s professional affiliations include the Georgia Music Educators Association, National Band Association, National Association for Music Educators, Phi Mu Alpha Sinfonia Music Fraternity, the International Trumpeters Guild, and Kappa Alpha Psi Fraternity, Incorporated. Mr. Rowland resides in Atlanta, Georgia with his beautiful and loving wife, Alva, who is an operatic performer and financial specialist, along with their twelve-year-old son, Tarik Jr. “TJ”; their eight-year-old daughter, Tarin; and two-year old daughter, Tarianna.